Well, I'm not going to make a habit out of having two weekend threads, but my dialogue with Mac Rogers on The Name of the Doctor just went up on Slate, so that's probably there and fun to read. Or at least there and fun to have written. Thanks again to Mac and the folks at Slate for letting me play. So while I'm opening a second front in the "let's all discuss Name of the Doctor" battle, I figure I'll toss out two (completely unrelated) questions to my readers to see if anyone can help. First, I've been searching for months now for any copy of Springhill, Russell T Davies's two-season apocalyptic soap with writing by Gareth Roberts and Paul Cornell. This seems a complete wipeout - nobody is getting anywhere close. It's a massive missing link in the history of Davies's Doctor Who, and there's barely any information about it out there. Second, and thinking ahead instead of back, I'd like to do a post on Outpost Gallifrey sometime during Series Two. Ideally adjacent to Love and Monsters. Unfortunately, the forum is long since gone off the Internet. I don't suppose that anyone, for some bewilderingly freakish reason, has an archive of the long lost forum, and specifically of the threads that sprung up around that episode? If so, you're a bigger digital packrat than even I am, but please do get in touch. My theory on Hurt's Doctor is that part of his "evilness" stems from him trying to gain a new cycle of regenerations, similar to the Master in the Deadly Assassin. If he is the lost Time War incarnation, then perhaps he ended the war and killed all of the Daleks/Time Lords by using the Eye? From Wikipedia "The Doctor deduces that the Master was planning to steal this energy to gain a new cycle of regenerations; however, if the Eye is disrupted, Gallifrey will be destroyed and a hundred other worlds will be consumed in a chain reaction." If I was the BBC, I'd definitely be beginning to cast around for an explanation for more regenerations about now, anyway. This is about Death. The experience of Death. Subjectively. I mean, it's pretty obvious --the Climax takes place in a Tomb, the tomb of the TARDIS, and they're everywhere and everywhen at once, like that time the TARDIS exploded. River is a ghost. Clara chants, "I don't know where I am!" -- like she's been uploaded to The Cloud. Like she's LOST. No wonder the monsters were Whisper Men. This is the place where Clara recovers the Leaf of her Mother, which embodies both Love and Death, the alchemical kiss, a Leaf given up to a god, that kills a god. Returned the token of the World Tree, Clara is no longer lost, she's found. This place is a place of both, of a contradiction, but a union of opposites. This is a place between the worlds. This Hurt Doctor, he isn't an Nth Doctor. He's an interstitial Doctor, spliced into the narrative. He's not even the Zeroeth Doctor, he's just The Doctor. The Doctor who's not the Doctor. A contradiction. A paradox. Thanks. Unfortunately, the forum required a login, so the Wayback Machine couldn't archive it. And that's the bit I'm really looking for - the grotesquely toxic hell that was online discussion. Aw, crap, I forgot about that little detail. Mea culpa, I do know better! Maybe you could write to Lyons and see if he archived the forums? Looking forward, someone should start archiving the interminable multi-thread discussion on Gallifrey base that I have come to think of as "Jon Blum versus the Bawbags". It starts with a not terribly accurate leak printed in Private Eye, develops into advanced Kremlinology about the shooting schedule of Doctor Who, and by now mainly consists of Moffat has betrayed and deceived The Fans. Unpacking the psychopathology of that debate would provide deep insights into fan psychology for a suitably determined researcher. In "The Wedding of River Song", Dorium talks about the Doctor's future visit to Trenzalore, the visit the Silence were working to prevent, when 'Silence will fall when the Question is asked'. Is that the visit we witnessed yesterday? Or is that visit the one yet to come, the one that will lead to the Doctor's death? Is the time-split version of Clara only saving the Doctor from the Great Intelligence? Or is she saving him from every problem and threat throughout his history? (The scene on Gallifrey suggests the latter). In which case, do we now have a universal solution for ever plot hole in the history of Doctor Who? "How did his escape from that in-escapable locked room? Oh, Clara let him out". is the John Hurt 'Doctor' the Valyard? I'm guessing not. I think acknowledging the Valyard in the earlier dialogue was actually a way of dismissing that possibility, a way of saying "you already know about the Valyard, but no, this is another, different thing". My guess? I think he's the Time War Doctor. (So all this time we've been debating whether the Time War was fought by the eighth or the ninth Doctor, it turns out that it wasn't either of them). This strikes me as being a good justification for only having the new series Doctors in the anniversary special. Dealing with a hitherto unacknowledged Time War era Doctor would would be a good reason to get Smith, Tennant (and Eccleston, if only) together, and would explain why the special didn't feature any classic era Doctors (as the pre-Time War Doctors wouldn't know that Hurt existed). Why did Clara only see eleven Doctors? If the time stream she entered dated backwards from the moment of the Doctor's death, surely she would have seen future Doctors as well as past, the 12th, 13th, 14th... 507th? Or is the 11th Doctor also the final one? And the presence of Library River makes me think, Mirror->Silver->Doctor Moon. The Doctor is going to go to Trenzalore at least once more. He will be the Eleventh Doctor at his second visit, as well ("The Fall of the ELeventh"). He will meet the Silence. He will die his final death. I don't see anything in this episode to suggest that that future has been averted yet; the Great Intelligence was trying to change history from the timeline where Eleven dies at Trenzalore in a battle with the Silence to one where he paradoxically kills the Doctor at every point in his timeline. 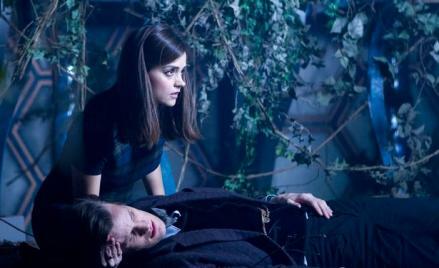 Clara restored the original timeline, where the Eleventh Doctor dies on Trenzalore in an as-yet untelevised adventure. In other words, yes, Eleven is the last Doctor, until that future gets changed. Did we see fhe Eighth Doctor at all in this episode? If not, how did Clara get to 11? Did we see fhe Eighth Doctor at all in this episode? Is he one of the Doctors we see jogging past Clara during the "you're inside my time-stream" sequence? The one between the 6th and 9th is hard to make out, I wasn't sure which one he was. In any case, I don't think we see Tennant's Doctor either, so we're clearly not being show every encounter she has. Yeah, I think you're on the money about Not Valyard for the same reason. But I thought that it was possibly essentially the same concept - Hurt is a potential future generation of the Doctor where he goes bad. I like your idea about him being the Time War Doctor though: that would make him a more real and interesting threat in the Big 50. However, I think it would destroy the essence of what the time war actually is (as Phil has been saying): The time war IS the Wilderness Years. A place where the internal forces of Doctor Who basically tore each other apart, all doing so for what they thought were exactly the right reasons. Still: Moffat just showed us one moment that I think should never have been revealed: the moment of the Doctor Stealing the TARDIS. And yes, it was shockingly disappointing. Why would someone ever actually put that on screen? How did a Victorian serial killer get hold of the time-space co-ordinates of the Doctor's final resting place? Is he working for the Intelligence? Or is there some significance in the fact that his name is Clarence, the male form of Clara? Is that implying that Clara (Generic Companion all this season) is Essence of All Companions? That the continual saving of the Doctor she does is by inhabiting, or being all previous companions? Or being the Essence that made them special enough to be companions in the first place? If so, I don't like it. Sarah Jane was not special because she was being Chrono-Posessed by some pan-dimensional Gen-Y bint. She was JUST SPECIAL. "And yes, it was shockingly disappointing. Why would someone ever actually put that on screen?" If you wanted to be nasty you could say that that is perfectly in line stylistically with the Hartnel era. No - no desire to be nasty. I enjoyed the episode, in the main. Some fabulous touches. But to see the actual moment of the Doctor nicking off with the TARDIS, and have it not be anything special: no stranger seeming than a bloke nicking a jalopy from a second hand car yard was I think a mistake. Perhaps I'm wrong. Perhaps it is appropriate that in the beginning it was just a little event, easily overlooked by everyone - even those most involved. But to actually depict it kills all speculation. It's one step closer to finally actually Making a Flashback Episode that answers all the pre-Unearthly Child questions. Which... ugh. I think just the GI. GI would be there on Gallifrey as he's there to screw things up for the Doctor at every point in his history. In this case presumably to nudge him to the "wrong" TARDIS, meaning he originally chose Clara's. So perhaps there's a sense in which the activities of Clara and the GI cancel each other out. I hope that's it anyway, it seems much better. Sorry, I didn't mean to call you nasty, if anything that's my own snark coming through. And I agree that Pre-Unearthly Child questions are best kept unanswered. The minimalism of that scene helps to preserve a lot of the specifics of "why? ", but still serve to indicate that Clara's involvement in The Doctor's timeline goes right back to the beginning. And also hard to reconcile with what we were told only last series in "The Doctor's Wife", which was that it wasn't the Doctor who chose the TARDIS, it was the TARDIS who chose the Doctor... (I must admit that I loved that bit, though). From the trailers, I was expecting the episode's big revelation to be that all the female companions were secretly really Clara (the "Clarence" who appeared in the cast list I was expecting to be a male version of Clara who would secretly be the male companions). If we have that scene, and we can argue about how appropriate/inappropriate it is all day, but we have that scene now, and at the very least the thing that I love about it is that Susan is there, in the long shot. We are supposed to read it as she was always intended: she is the Doctor's granddaughter. I love how the problem of Susan is just embraced and remembered. Tennant did show up. He's at about 35:30, when we see Future Clara in the red dress looking at a cityscape. He's in the background, on the right side of the screen, looking at the same cityscape. I don't think he was so much wearing the companions' outfits as wearing period-appropriate clothing. I viewed it as part and parcel with the way they changed the film quality to match the era of the Doctor. If, as we now know, "The Doctor" is a title only taken by some, but not all, of our protagonist's regenerations (so that Matt Smith can be the 11th Doctor, without being the 11th incarnation) does this open a path for the "Mobius faces" to be actual pre-Hartnell regenerations? No, I definitely read it as "every bad cliffhanger was the GI's fault, every bad resolution was Clara's fault." "also hard to reconcile with what we were told only last series in "The Doctor's Wife", which was that it wasn't the Doctor who chose the TARDIS"
Only if we think Clara is doing more than correcting the sabotage of the Great Intelligence (as per my post above). Perhaps the Silence didn't want the Hurt Doctor to run loose? Tennant's Doctor isn't at any old cityscape -- that cityscape belongs to The Library. There's something about being The Doctor that makes the Doctor the Doctor, and not just some bloke faffing about with a fake medical degree. And it's the same with Companions. There's something about being a Companion that makes one a Companion, and not just a traveling assistant -- and I think the story was trying to say that "essence" had to do with willing self-sacrifice. In other words, 5tephe, it's not that Clara is the Essence, but that she represents that Essence. (Ugh, I hate talking about Essence.) It's not like she's wearing the actual outfits of other companions, but she's period-appropriate, what could work in any given Doctor's era. She's more an an interstitial presence, a ghost, but not the Ghost. I don't understand this sexism thing. "Surrender your women" is a classic military line and Strax isn't Strax at that moment. He's a bad Sontaran who never met the Doctor. And the "I didn't know you were a woman" like is a roundabout way of Clara saying that she did not expect that they may have had a more intimate relationship. It also points out that "Professor Song" is a strong, independent character who the Doctor worked with as an ally, not in the traditional companion sense. The Outpost Gallifrey forums are archived, but I'm not sure if you can log in. There is another forum, Doctor Who Online, which has threads avaliable all throughout the new series, and I believe from the original airing. There won't be as much as Outpost Gallifrey, though. I'd say that most of the time, Clara and GI's actions simply cancel each other out, so what we end up seeing is mostly the Doctor doing his thing, but every once in a while, they go a bit out of balance and you get a bad cliffhanger or a pat resolution. And a very few times, they become intrusive enough that the Doctor actually notices. Also remember, Clara's telepathically linked to the TARDIS at this point. I have no idea what this means in context, but maybe from the TARDIS's point of view, Clara was acting as her agent in that bit. Dorium refers to what happens at Trenzalore as "The Fall of the Eleventh" And, of course, they get to Trenzalore by falling. Where are they archived? I couldn't find them when I went looking, but I may have been thick. I was referring to the Web Archive link that was posted above. I'm sure it's not as good as Outpost Gallifrey, but at least it's something. I find the reception to "Love and Monsters" interesting, because I haven't yet found a negative review from critics at the time of broadcast. IGN gave it 9/10, SFX had 4.5/5, Slant Magazine gave a positive review. I also have the Who is the Doctor? reference/review book that was published last year, and it gives a positive review too. I, personally, really liked the episode up until the Jackie seduction scene, which I thought was kind of inappropriate, and then the monster thing was a bit unbearable. But it's high on my list for rewatch when I feel like it. But Dorium told us that no one if asked the question at Trenzalore could speak falsely or fail to answer. But when the Doctor is asked, he fails to answer. Suggestions? Ooooo... thanks for that tumbler.. for some reason I was thinking it was Pat! Thanks, Froborr and Ross; I'd missed that too. Thank you -- I had thought that Hurt resembled an older version of McGann's updated Eight Doctor look, but clearly that's not what's up here. "Surrender your women" is a classic military line and Strax isn't Strax at that moment. He's a bad Sontaran who never met the Doctor. But no, that line comes before he forgets the Doctor. It's from when they've just arrived on Trenzalore and haven't even run into G.I. Simeon yet. Anyway, if Sontarans can't tell males from females, it's an odd demand. "Love and Monsters" was the episode that prevented me from watching Doctor Who. I was aware of the reboot, but having been less than enthused by the 1996 tv-movie, I hadn't watched it; then one day while channel-surfing I caught a bit of it, was revolted by the Abzorbaloff and still more by pavingstone-Ursula, and never watched it again until I caught the second half of "The Beast Below" and was hooked. I'd actually forgotten about "Love and Monsters" until I watched it again and realised why I'd been thinking of the new series with faint distaste. But what's the question? The question isn't "What is the Doctor's <strike>real</strike> birth name? "; it's "Doctor who?" But it's a living creature who was asked and didn't answer. I caught resonances of Moorcock's Eternal Champion concept. An archetypal Hero who is the 'same person' while existing simultaneously as different characters across the multiverse. Even existing in different genres as Moorcock pastiched Detective, Sci-Fi, Sword and Sorcery and experimental fictions. There are even books where different versions of the Champion meet to combat Multiverse threatening monsters (this pre-dating 'The Three Doctors' by a good few years). The real connection is that there was also an Eternal Companion who also turned up in every parallel world to befriend and assist the Champion. Moffat does like to indulge in both overstated and understated revelations. However I do enjoy them! Of course we now know that somewhere between those two episodes he met the living River Song for the last time in his timeline. To which hiding out on a cloud seems a reasonable reaction. This also means Clara saves the Doctor in another way also - emotionally after the death of his wife. Also the Valyard reference was another ticking-the-box reference to a past Doctor. This series has been chucking them in at various levels in each episode quotes from past Doctors, impersonations, shout outs to old episodes. Inevitably there aren't many such things you can do with the Colin Baker era. Oh, well if it's just period appropriate clothing, then alright. Phew. Thanks, Ross, that's what I was trying to say. Also, they're in the Underworld. And, as fans of stories know, it ALWAYS costs something to leave the Underworld. My roommate raised a good point -- Clara was constantly being born, saving the Doctor, and dying again. At least two of those occasions (the scene with One and the clip from Arc of Infinity) were on Gallifrey. Since I find it improbable that the Time Lords at the height of their powers would be unable to detect a human-form temporal anomaly wandering around Gallifrey, does that mean Clara was actually born into the body of a Time Lady on one or more occasions? The theme is of course death but more than that it concerns the Beyond, that which cannot be described or spoken. What is seen and what is hidden. Obviously the major hidden aspect of the Doctor is his name. His mirror Female reflection River Song here can be heard but not seen. Yet as it is revealed later the Doctor always sees her. The first time we see the Doctor he is blindfolded, a common affectation of spiritualist mediums. So much of the imagery was of communication with the dead. The Paternoster gang, via the 'conference call' that resembles a typical Victorian seance, contact the 'twice dead' Clara and the dead-but-preserved River Song while assailed in the material realm by unliving undertakers. Jenny is killed and returned from the dead. The signature gesture of Madame Vastra (even her name suggests a psychic medium) is aways that of lifting her veil. In esoteric terms the veil is lifted to reveal hidden spiritual wisdom. Vastra in Tarot terms then is the High Priestess. The main action takes place in a graveyard and the Tardis is made into the Doctor's tomb. The narrative describes two journeys one is the Doctor's Time Line from Gallifrey to Trenzalore, manifested as a network of endlessly branching light. To me this recalls the Kabbalistic journey of the Tree of Life from Kether to Malkuth. The second journey is the Doctor's search for and rescue of Clara from within his own time line recalling that of Orpheus into the Underworld to rescue Euridice. The final reveal of the 'hidden Doctor' suggest the mysterious 'hidden sephira' of the Kaballa - Daath - considered the point of creation, when the active principle of Chokhmah - 'wisdom' meets with the passive principle of Binah -'understanding' and creates the archetypal idea of knowledge.which Crowley describes as corresponding more or less to the gap in thought between the Real and the Unreal. The numerical positioning of the Hurt Doctor can only be one of two - pre Hartnell therefore Zero or between McGann and Eccleston, a hidden nine bumping Tennant to eleven and Smith to twelve. In Tarot terms Zero is the Fool, The trickster or Joker who is poised on the cliff edge ready to make a leap into the unknown. In one hand he holds a rose, in the other his belongings in a bag on a stick. His companion (in some decks a dog, in others a cat) is running at his heels. Nine is The Hermit, Ten the Wheel of Fortune, Eleven The Hanged Man and Thirteen (appropriately) is Death. BerserkRL - But Dorium told us that no one if asked the question at Trenzalore could speak falsely or fail to answer. But when the Doctor is asked, he fails to answer. Suggestions? During that scene, I thought for a moment that the Doctor's name was "Please" as that's what he says just before his tomb opens. Then rejected it immediately on the grounds that "Doctor Please" sounds like a bad 70s sitcom. The Great Intelligence or the Whisper Men told him. He's a plant, intended to draw the Paternoster Gang into the trap so they can be used to bait the Doctor. @BeserkRL I'd missed that too, mainly as it looked to me to be the same location as Pat Troughton's running in the big fur coat moments later - I'll have to re-watch. If it is, that rather points to another (unseen) multi-doctor Season 6b story for Pat! The real connection is that there was also an Eternal Companion who also turned up in every parallel world to befriend and assist the Champion. Though in Moorcock it's hinted that the Eternal Companion is in turn an aspect of the Eternal Champion. For instance, the companion is sometimes named Jhary-a-Conel or some variation thereon, while the Champion is often named Jerry/Jherek Cornelius/Carnelian or some variation thereon. This is probably a dumb question, but where did that name, "the Paternoster Gang," come from? If it was mentioned in the show itself, I don't remember it. Tesselector Amy says "Doctor Please!" The Tesselector is a Mirror. That's correct. There are resonances, echoes and reflections of the Champion and Companion all over the multiverse not even restricted to humanoid form. I'm thinking of the twin swords Stormbringer and Mournblade in the Elric novels which mirror the matching needle guns of Jerry and Frank in the Cornelius books. It's become a bit of a Fantasy trope and I'm not suggesting a perfect match with the multi-Claras just a notable similarity. Time's Champion and now the Companion Eternal. @Ross: And that, I think, is the key. It's not just Clara, it's the TARDIS as well. The TARDIS doesn't want to go to Trenzalore because she knows what comes next. She knew how to take the Doctor to where he is needed, because she had the Doctor's timeline entwined within her as a result of Clara entering the whateveritwas. So yes, that scene of Clara on Gallifrey can easily be read as the first intervention of the TARDIS - and onwards from there. It gets... weird if you think about it. Either the Claras led to a lot of divorces, or she was always born to parents who at least vaguely resembled her--did the Clara template only overwrite itself onto genetically similar fetuses? Or was all of history rewritten from the beginning so that lots of Claras would be born? Wait... where was it established that Clara is telepathically linked to the TARDIS? Also: The TARDIS knows where to take the Doctor because she exists outside time. It's the same reason she already has future console rooms archived. Froborr is correct that "Clarence" was told by the Whispermen in order to draw the Paternoster Gang in. There's also a prequel scene, titled "Clarence and the Whispermen", on the DVD set, showing this. That assumes that Clara actually gets born every time. For all we know, she simply pops into existence a bit before the Doctor arrives, and Time hastily shoves some stuff out of the way to sketch out a backstory for her. I note that we don't meet any family for the other two of her that we meet. Hurt looked like a Prisoner-remake Number 2 to me. Thanks Josiah! I'd almost forgotten about that. Phil, hoping you got my Springhill email! Cheers. "The Outpost Gallifrey forums are archived, but I'm not sure if you can log in." --Let me worry about that. It's what parents say to children isn't it? 'What's the magic word?' 'Please'. I momentarilly read it as a take on Tolkien's 'Enter Friend' untill the River Song explanation. In keeping with this, I read, "So how am I still here?... Spoilers," as equivalent to one of those "maybe there was a real ghost after all!" endings. That, in other words, maybe there are powers the Doctor doesn't understand that enable her to reach out to him from beyond Death, above and beyond the back-up in the Library and the link to Clara. Also, perhaps this is too obvious and that's why no one else has pointed this out, but "Clara" is from the late Latin "Clarus," meaning "bright, clear, famous." She is that which illuminates, pouring down the Sephiroth from the Ein Aur Soph above, the light and the revelation which begins at its endpoint (Trenzalore) and trickled down to the meet the seeker all along the path. Still thinking through implications of this episode... Oswin says in "Asylum of the Daleks" that the Alaska was her first trip through space, and that was when she crashed on the Dalek Asylum and was made into a Dalek. So was the Clara at the Library with Tennant a different future Clara in the same dress? St. Clarus as the patron saint of tailors is just SO deliciously appropriate. I like your reading of 'How am I still here?' as a ghost story trope. I suspect though it's one of those plot holes that Moffat noticed as he was writing and decided to lampshade and which may pay off in a future episode. Oswin's "soufflé talk" at the beginning of Asylum takes on a whole different meaning now. I read "Spoilers" in a couple different ways. First, River said she got to Trenzalore riding on Clara's consicousness, so River's presence implied the Clara's being alive, still; she suggests she knows what happens with Clara and the Doctor going forward; it's implied an earlier, living version of River might participate in that or another adventure. I thought it was implied by River's reaction to Clara at the 'Conference Call' that she didn't know her (and was also jealous and a bit miffed that the Doctor hadn't mentioned her). I see no impediment though to an earlier River having further adventures adventures with any number of Doctors that we either haven't been shown or haven't yet happened. I'm also not sure that the River we see in TNOTD is actually from the Library data base. She could be lying to protect the Doctor. However, we do know now from that brief clip that Clara was at the Library at the same time as Ten and could have met River there. I'm also wondering whether the pictures of all his faces that River carries includes the Hurt Doctor. Also, in passing, it's worth noting that the TARDIS already apparently had Clara in her holographic projection library, which wasn't entirely explained but would make sense if they were entangled. Note that I don't dispute that the TARDIS exists outside of time, but if anything I think that might be an argument *against* her being able to take the Doctor to the "right" place since it would be meaningless to her. The series began with Asylum of the Daleks inside a giant Dalek statue in a battlefield graveyard on Skaro and ended with The Name of the Doctor inside a giant Tardis in a battlefield graveyard on Trenzalore. The mid season finale The Angels Take Manhattan also ended in a graveyard after showing a Giant Weeping Angel (in the form of the Statue of Liberty). I don't know what any of that may signify, if anything. But I'm sure someone will have a go at interpreting it. I thought it was implied by River's reaction to Clara at the Conference Call that she realized this was Clara's first time meeting River -- just like when River realized Amy was meeting for the first time at the Byzantium. And can I just say I love how River's grave is a false grave that's a secret entrance to the Doctor's tomb? Love a tomb. Hmmm maybe. Initially that was how I read it but it all gets a bit Wibbly as soon as Clara does the jumping into the Doctor's Time Stream thing. As Clara is now present at all the Doctor's most dangerous moments to save him (or possibly just the ones affected by the GI it isn't clear yet) I can't help feeling River is gonna be a bit jealous. Particularly as Clara, unlike Amy, doesn't, as far as we know, have any blood ties to River. Yeah I love a tomb with a secret entrance too. Just a hint of an echo of the Pandorica there I thought with the torchlit tunnels and all. Did River and the Tardis design it? I'm still holding out for CAL being revealed as one of the Claras (as opposed to my prior theory, which was vice versa).